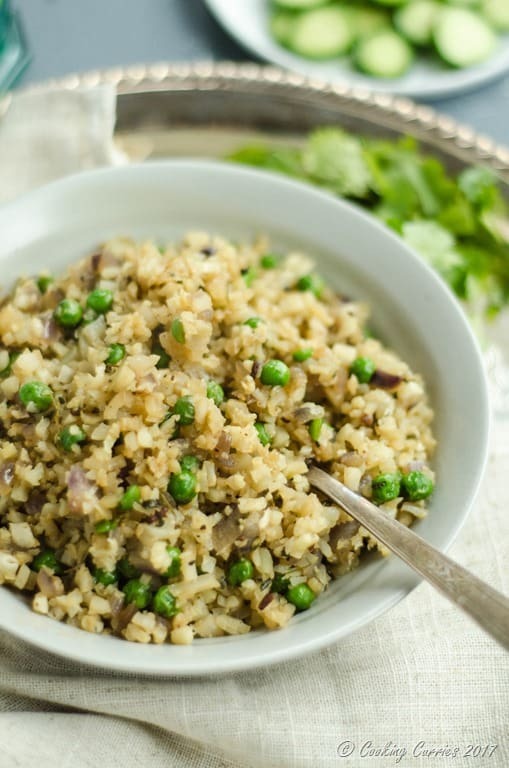 A quick and easy Pulao with Cauliflower rice and peas to make it a low carb meal that is delicious at the same time. Pulao is my go-to recipe when I don’t have a lot of time to make rice and a curry to go with it. Pulao is like an all-in-one deal. A Pulao is essentially a rice dish made with vegetables and spices in it, so all you need is a quick raita with yogurt and onions and cucumber or just some yogurt and pickle to make a meal out of it. 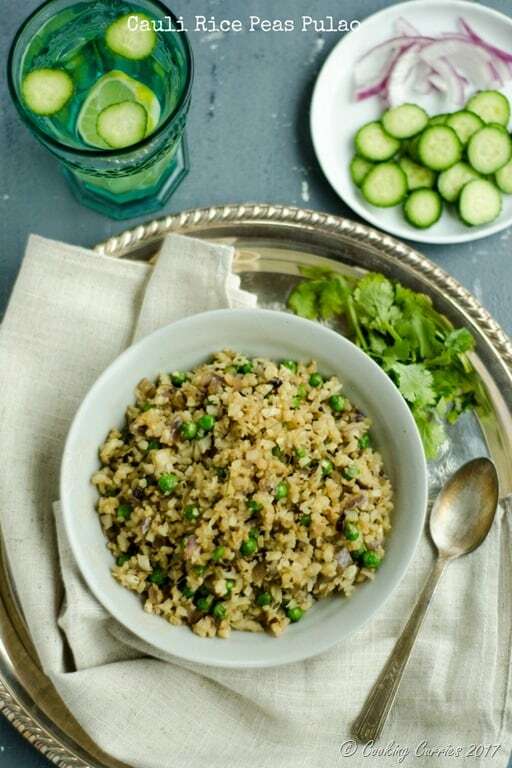 This Cauli Rice Peas Pulao is made with Cauliflower rice instead of basmati rice. Cauliflower rice is essentially riced cauliflower – where you take out florets of cauliflower and just pulse it in the food processor till it resembles small grains of rice. The benefit of using cauli rice is that you are cutting all that white rice out of the equation and it instantly becomes a low carb version of your favorite pulao. Literally instant because it doesn’t need a lot of time like rice to cook, just a quick stir and cover and cook for a couple of minutes to just soften it a little but not too much that it gets all mushed up. Disclaimer: some links in this post are Amazon affiliate links and I may receive a small percentage as commission when you click on these links and buy something. This is at absolute no extra cost to you and helps run Cooking Curries to bring you more delicious recipes. Heat the oil in a pan. Crush the cardamom, cloves, cinnamon and black pepper in a mortar and pestle. Add this and the onions and garlic to the hot oil. Once the onion softens a little, add the cauli rice and salt to it and mix well. Add the green peas as well and sprinkle a little water. Cover and cook on medium heat for 3-4 minutes. Open the pan and remove from heat. 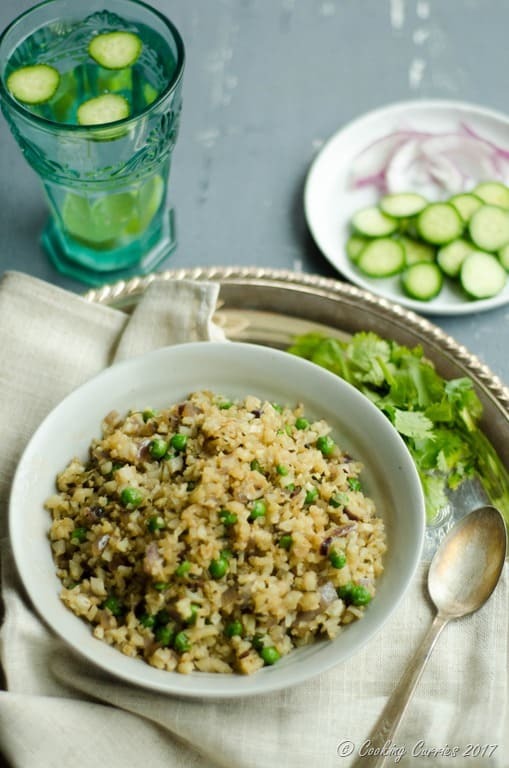 Crush the kasuri methi between your palms and top the pulao with it. Squeeze the juice of half a lime over the pulao as well and also sprinkle the garam masala over it. 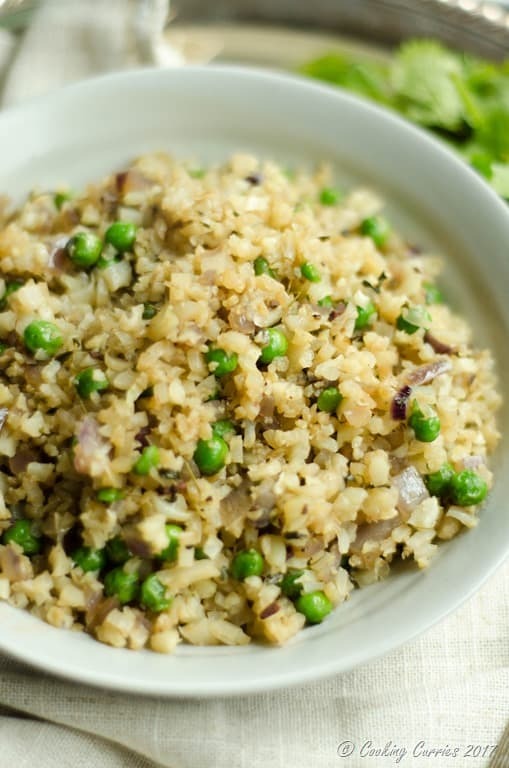 A quick and easy Pulao with Cauliflower rice and peas to make it low carb meal that is delicious at the same time. One perfect veggie packed side dish! I would happily eat this for dinner! I love one-dish meals, especially ones containing rice. Now this looks like an exciting pulao!! Love the idea to use cauliflower. I wonder if you have to fry the cauliflower at some point or if you just have it raw? It’s not all raw, you sauté the cauli rice and also cover and cook with just a little water. This is such a lovely recipe. I love the spices. I love cauliflower rice! Never tried making pulao with it though!